PITTSBORO, NC (WTVD) -- Almost 30 cats seized from a Chatham County farm last month are now up for adoption at the Chatham County Animal Shelter. 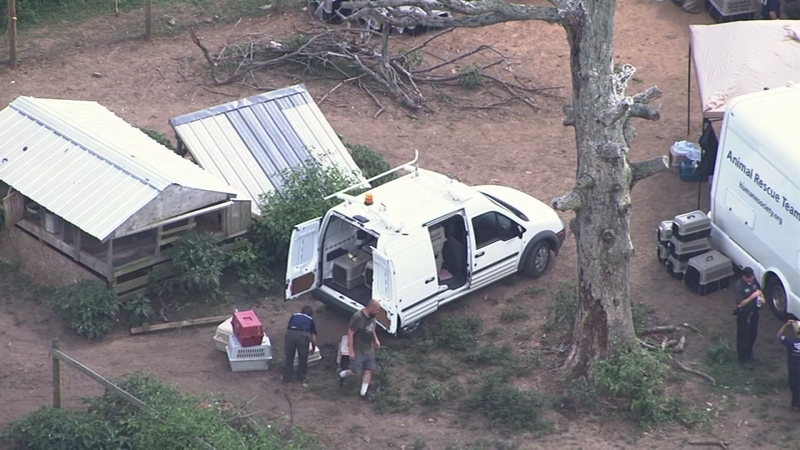 The cats are part of a group of over 150 animals rescued from the farm on Silk Hope Gum Spring Road. Leigh Anne Garrard is the director of Chatham County Animal Services. She said some of the cats were living without food or water, and many were living in their own filth. "They were exposed to upper respiratory infections and ammonia levels that were too high, so it actually disfigures the eye and can cause some blinding," Garrard said. She said that now, after weeks of medical attention and recovery, the cats are healthy again and regaining the shine in their coats. Garrard also said Chatham County Animal Services has received anonymous complaints about the farm's owner, Stephanie Joostema, for years. "This has been literally an ongoing process for three years," Garrard said. "And so it has taken a lot of efforts on our end to maintain - that we're staying on top of follow-ups [and] that we're checking on the animals." "And that when we realize that the conditions are past what we would consider to be appropriate, that we moved, and had to then plan for months for the removal of them," she continued. The Chatham County Animal Shelter has dropped the cost of adoption for the animals rescued from the raid, to $20 in hopes of finding the animals new homes. Other animals seized from the farm are being placed in shelters across North Carolina, Virginia, and Maryland. The other organizations taking in animals in North Carolina include: Safe Haven for Cats, The SPCA of Wake County ,Red Dog Farm, Horse Helpers of the High Country, and Carolina Waterfowl Rescue. Click here to see photos of the animals. The Humane Society of the United States says 150 animals were removed from a farm property in Chatham County Wednesday.